My mom loves to bake and almost every weekend you can find her in the kitchen baking up some delicious treats for the family. This recipe was one that was handed down to my mother from her mother...so it's been in our family for at least the past 35 years. 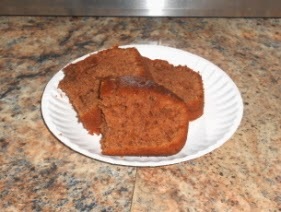 You can bake this cake in a tube pan, a regular cake pan or even a loaf pan if you want to slice it up like a quick bread. The choice is entirely up to you. In a large mixing bowl sift together the flour, sugar, salt and all of the spices until well sifted together. Gradually blend the vegetable shortening into the dry ingredients by hand. Mix the baking soda into the applesauce and stir until blended. Stir the applesauce mixture into your flour mixture until well blended. Fold in the raisins and finely chopped walnuts. Preheat oven to 350 degrees F. Lightly grease your baking pan or spray it with nonstick cooking spray. Pour batter into pan. Bake in the oven for 40 minutes...it might take longer depending on what type of pan you are using. Remove and let cool.